This course is designed to teach trained cave divers how to utilize Diver Propulsion Vehicles (DPVs) in the cave environment. 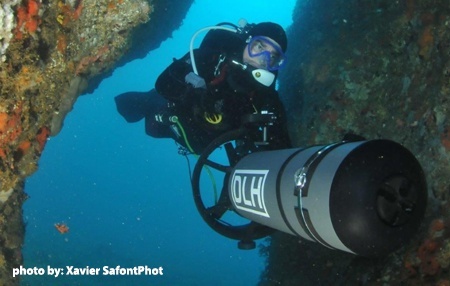 Divers will learn about safe DPV use, DPV components, and care and maintenance. Students will learn to plan dives that may incorporate extended penetration, longer bottom times, complex dive planning, and proper methods of gas management. The certified TDI Full Cave Diver or equivalent with a minimum of 25 logged cave dives. The certified cave diver looking to expand their diving range, abilities, and skills. Share gas with DPVs while maintaining visual contact with the guideline. If each diver utilizes a single DPV, each diver must turn the dive with no less than twice the amount of gas required to exit the cave while swimming. If each diver utilizes multiple DPVs, each diver must turn the dive with no less than twice the amount of gas required to exit the cave while utilizing the DPV. No equipment removal in cave with exception of stage bottles if utilized 39 metres /130 feet maximum depth. Students are encouraged to gain experience before attempting to plan and execute complex DPV cave dives. Safety and decompression stops are completed as appropriate or necessary.